I’ve added up the financial numbers from the last year and will share the results with you in a few different posts. This one focuses on where I found the items I sold. I owe many thanks to my friend Sarah, who did most of the work designing the excellent infographic below! Note that while I did achieve my goal of 20k for the year, the numbers here add up to something closer to 15k. This is because I don’t keep track of the origins of the items I sell at yard sales, the small change I deposit to my bank account, and much of the gold and silver I sell for scrap. I should note a few factors that influence where I end up looking for trash. The first is geographical convenience. In 2015 I became even less motivated to travel long distances for trash. It costs a lot more in gas and mechanical wear and tear to go somewhere like Pointe-Claire, and it takes a bunch of extra time as well. For reference, I live roughly around the location of the dot in the Plateau. The second is the quality of the garbage day. The best is when neighbourhoods put out garbage and recycling just once a week on the same day (ie: Verdun, Mount Royal, Hampstead, Rosemont, much of the Sud-Ouest). Second best are neighbourhoods with two trash days a week, and a recycling day that coincides with one of the garbage pickups (ie: NDG, CDN). Roughly equal to that are those with one trash day and a different recycling day (ie: Cote St-Luc, VSL, Westmount, Lachine). The worst are neighbourhoods with two different trash days and also a separate recycling day (ie: Ahunstic, Plateau, Montreal North). The more pickups there are the more spread out the good finds will be. At this point I mostly avoid those lower-tier neighbourhoods. The exception here is the Plateau, which I’ll often explore because I enjoy walking or biking around the neighbourhood. Fortunately, Montreal is apparently now moving to standardize the once a week trash pickup. Much of Villeray recently converted to a once a week pickup, making it a much better picking destination. I won’t necessarily know when a trash schedule changes, so if you’re living in Montreal let me know if they switch around your trash days! The third factor is the wealth of the neighborhood. I’m more likely to travel to wealthier spots because they have a track record of throwing out the best stuff. Plenty of neighbourhoods have small enclaves of wealth, but only Westmount, Hampstead, and Mount Royal (of the places I regularly visited) can be characterized as generally wealthy. 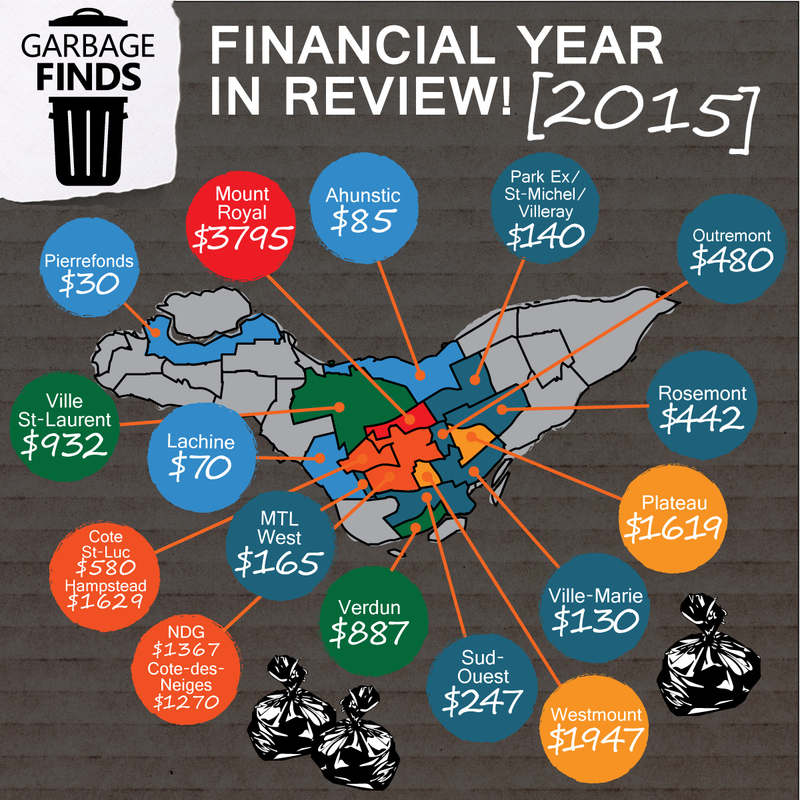 My most profitable neighbourhood this year was Mount Royal, which I would rate very highly in all three categories. It’s worth noting here that the frequency of my visits is probably the biggest factor determining a neighborhood’s final profit numbers; I went to Mount Royal more than any other borough this year. Let me know if you have any questions or suggested destinations! I may not actually make it to the places you suggest, but I always appreciate the information. Check back soon for a regular post, or another financial summary. Whichever comes first. Grey: no sales of note. Previous Post The best of 2015! Sarah did a wonderful job on the graphic. I’m not usually into “numbers” stuff, but you sure did make the analysis interesting. And it’s great to have an insight into your modus operandi. I don’t usually think of the distance in terms of kilometers, only a general idea of the minutes it takes to get there. But for perspective I looked up a sample of some numbers. Note that the distance is calculated from whatever Google Maps defines as location of the neighbourhood in general. This is an interesting graphic. Please thank Sarah for us. I’m glad you shared it. I didn’t end up going there much in 2015. In 2014, I had one of my most profitable days ever there when I found the teacup collection and some vintage electronic pieces that probably made me over 3k overall! I think that was mostly lucky but there are good things to be found in VSL. If you do go out, do so during the heavy garbage days at the beginning of each months. Otherwise you have to check bins all the time, which is a bit of a crapshoot. Thank you for your updates. They are quite entertaining. Best wishes in the new year. May it be even more lucrative for you! Wow, you found some amazing stuff last year. Good luck in the new year and well done on making $20k! How will this info change the way you search this year? I think the info follows my hunting patterns more than the other way around. Meaning, the numbers are a result of the decisions I make about where to go. This year I focused a bit more on wealthier neighbourhoods, so my totals from there are better than in previous years when I had much better numbers (at least relatively) for places like Rosemont. I’ll probably keep doing the same this year. Maybe I’ll come to some other realization though that will change my technique, and as a result my numbers. great work for 2015, martin! i love reading your blog, and have followed you since your first days. memorial university in newfoundland offer a folklore degree, and i think of you as a working folklorist-rather than an academic one- you use your sociology skills and training every day. keep up the good work in 2016! Good for you, Martin! I still cherish a little freshwater pearl necklace I pirchased from you in your early days. You are a role model for all of us with your persistence and hard work. Here’s to an even more prosperous 2016! I remember that. Glad you liked it!